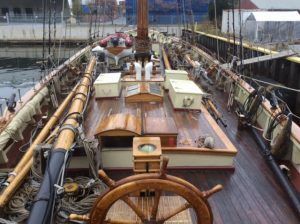 Deciding not to sail a sailing vessel during the cold climes of winter seems like an obvious thing, but contrarily it is not. Sure, cold weather sailing is not for the feint of heart or the ill equipped or ill prepared. To some degree that is the simple aspect of the decision…be prepared, or do not sail in cold weather! But when a vessel is neither active nor lived aboard during cold weather, there is no need to provide heat throughout the vessel, thus there are many attendant details to consider for preventing damage to onboard systems due to cold weather. In the instance of a traditionally built wood vessel, an additional consideration is shielding the vessel from sun and wet weather. Both combine to cause significant degradation to wood surfaces, coated or not. 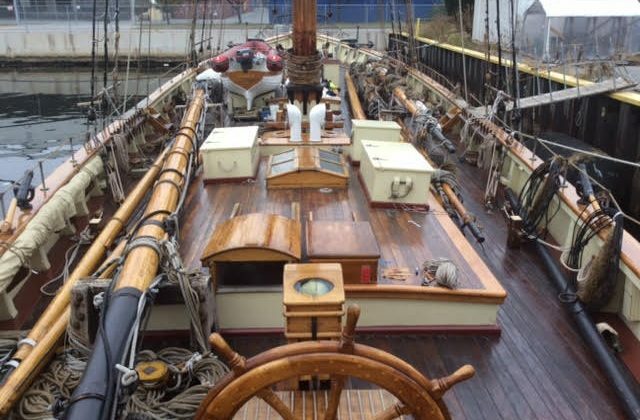 I suspect uncovered & unused wooden vessels in cold weather climes will age at least as fast as from a fully active sailing winter in warmer climes with crew aboard taking care of things on a daily basis. Whereas the cold and wet hinders any interest or even capability to clean or maintain any observed needs. Plus, regular sun exposure while resting in only one orientation concentrates aging. Thus it is that the PRIDE OF BALTIMORE II’s winters spent in her homeport involve down-rigging all that can be taken out of the rig and covering all as well the ship with something (we use white plastic) that both keeps everything dry and the nearly completely emptied out below areas free to be open hence well ventilated (long term closed up is very deleterious to wood vessels)…but also shielded from sun rays power to age coatings, even reduce the amount of drying of the outside wood construction (deck & above water hull) that comes of regular direct sunlight without benefit of daily cleaning/wetting or changing direction of exposure of an active vessel. The included photos provide a small hint to why it takes at least three-four weeks to winterize PRIDE. It will take at least twice as long to reverse. Thus it is Marylanders’ Sailing Ambassador of 27 years of age and over a quarter of a million voyaged nautical miles is as strong & beautiful as she was when new…as well as being admired worldwide. Thus it is she is ready and able to continue her ambassadorial voyages of imagination and promotion of Maryland & Baltimore far and wide. What do all of you say?